Total weight: 90 Kilos - I still haven't gained anything, but I'm seeing the dietition soon. Sleep: I've actually been getting next to no sleep, which is making me pretty emotional, resulting in my crying at nearly everything. 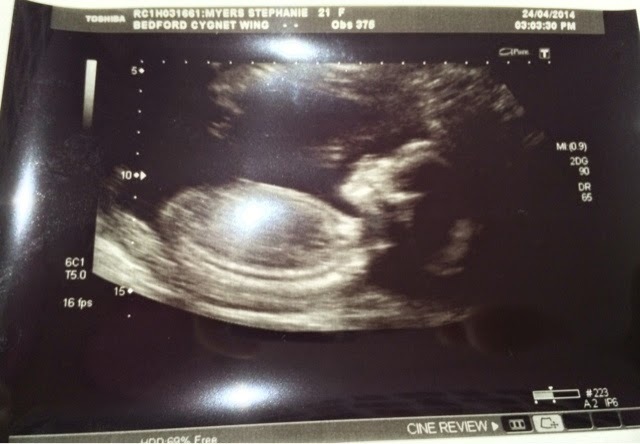 Best moment this week: We had our 20-week scan, which is an abnormality scan. Everything is absolutely fine which is a massive relief. Her heartbeat is strong too. Miss anything: Being comfortable in clothes, even my maternity clothes ain't that comfy. Movement: I have been feeling her move, kick and riggle a lot. However Sam hadn't felt her kick yet, last night he felt her kick for the very first time, I've never seen him so happy. He was really overwhelmed. Symptoms: I have been feeling really sick this week, it eased off a little last week but it seems to have come back with vengeance. I also still have a lot of pain in my stomach. How do I feel: I find myself feeling tired most of the time, very fed up, and I wish the stomach pain would subside. I'm sure I'll forget about all of this once she is actually here. Week 20: If your baby is a girl, her ovaries now contain around two million eggs. This will reduce to one million by the time she is born.